Actionable Advice from Someone That's Actually Done ItDid you know that most "how to make money online" and "passive income" books are written by people that have never actually launched a real online business?Stop reading entrepreneurship books that were written by pretenders. 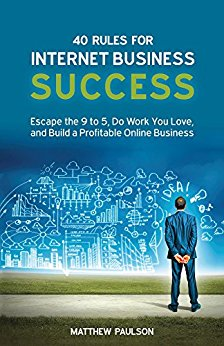 Read 40 Rules for Internet Business Success and you'll learn from a multi-millionaire entrepreneur that has created multiple six-figure and seven-figure online businesses from scratch. Matthew Paulson, Founder of MarketBeat.com, has weathered the failures and triumphs of entrepreneurship for more than a decade. 40 Rules for Internet Business Success is his collection of core principles and strategies he has used to identify new business ideas, launch new companies and grow his businesses. By reading 40 Rules for Internet Business Success, you will learn to:Throw away your business plan! Create a scalable business model that actually works.Identify a target market that is desperate for your company's products and services.Launch your first product or service faster by building a minimum viable business.Create a reliable and repeatable marketing strategy to keep new customers coming. Understand why most "passive income" business ideas are doomed to fail (and how to beat the odds. )Build systems that make your business run like a well-oiled machine.Maximize your company's earnings potential with the three keys of revenue growth.Whether you want to learn how to make money online, create passive income streams or build a massive online business empire, 40 Rules for Internet Business Success will help you turn your dream of starting a business into reality.EXTRAS WITH EVERY PURCHASE: After purchasing the book, open it and follow the directions inside to receive access to the two bonus audio interviews titled 40 Bootstrapped Business Ideas and The Seven Deadly Sins of New Entrepreneurs. Want to learn how to make money online?Get your copy of 40 Rules for Internet Business Success today and learn how starting a business may be the best decision you ever made. Scroll to the top of the page and click on the buy button.